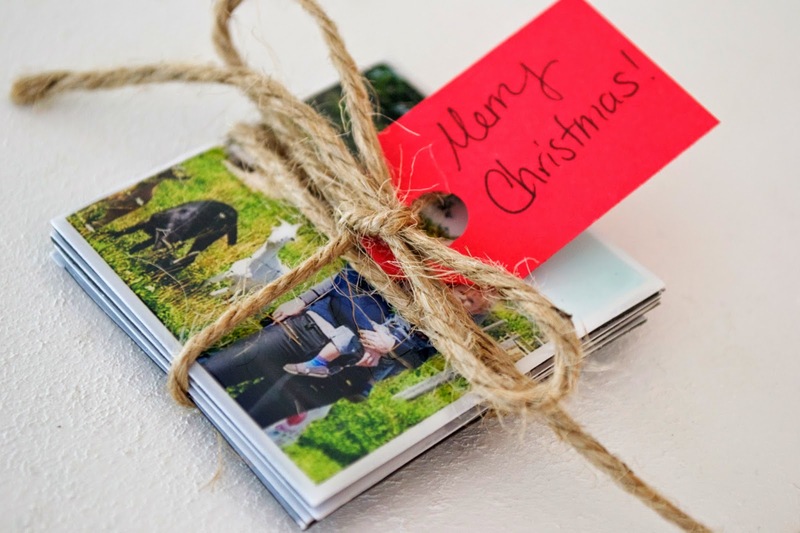 For Christmas presents this year we decided to get a little crafty and try our hand at some homemade photo magnets. 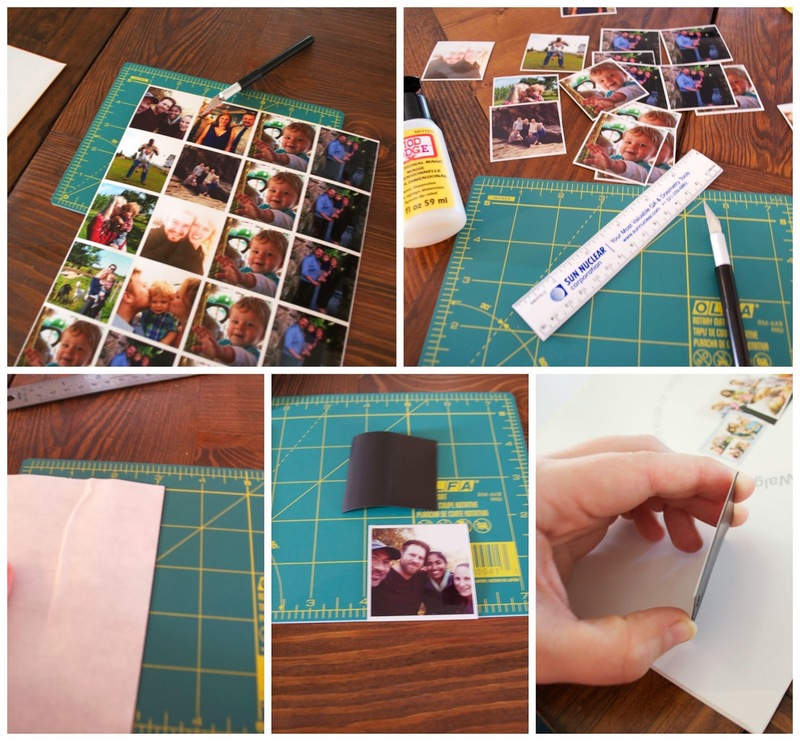 Then there was a lot of cutting... both the photos and the magnetic sheet. I cut the magnet to the approximate size of the pictures, attached the picture and then trimmed the edges. As I type this I'm now realizing it probably would have been faster/easier to cut the magnet the size of the 8 x 10 and then just cut the pictures out from there... live and learn. You can see that the magnets are pretty thin so to give them a little more oomph and to protect the photo I used the dimensional magic to cover the top of each magnet. This turned out to be a little tricker than I originally thought so I thought I'd share how I got a pretty good layer on top without it spilling over the edge. 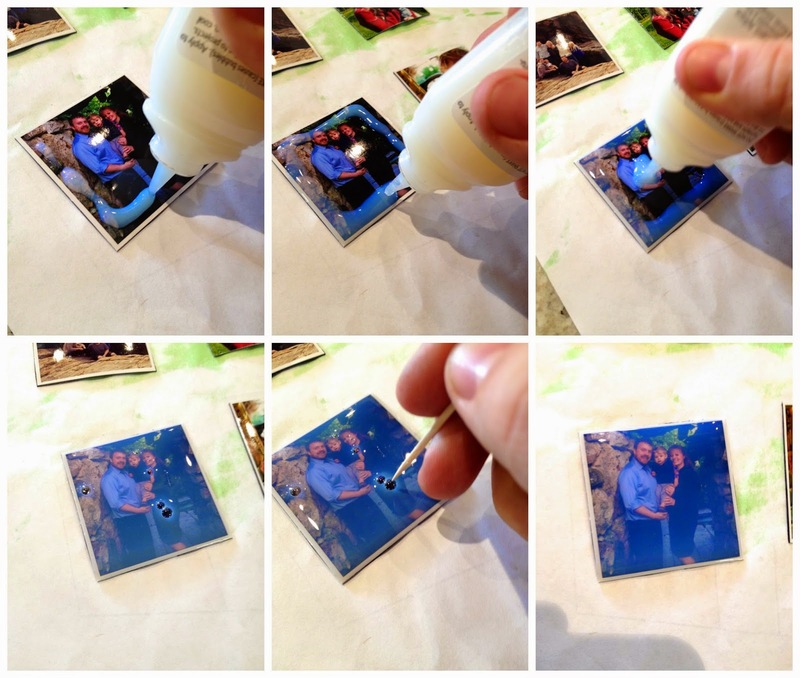 Surface tension is the force keeping the mod podge on top of the picture so you can't break that. If you start with too much mod podge near the edge of the photo then as you add more to the center the surface tension is overcome and it just flows off. Instead, I put a ring of mod podge about a 1/4" in all away around the picture and then used the tip to pull it out toward the edge, being careful not to go over the edge. Then I could fill in the center without too much concern. Usually there were a few bubbles so I would pop them with a tooth pic. The last key is that you need to keep the picture completely level and DO NOT TOUCH for at least 12 hrs preferably 24. Some people advise to put a cup over the top (upside down) to keep dust off but I found it took a ridiculous amount of time to dry that way and I didn't really have a problem with dust. The mod podge became crystal clear once it dried. The magnets are still very flexible and still on the thin side once they are done and light enough were the stick to the fridge really well. We kept a few for ourselves and gave the rest away as gifts. I love having a few of our favorite photos hanging out on our command center. *This post contains affiliate links. Thank you for supporting Seesaws and Sawhorses!